Aurora, OH: Network Technologies Inc (NTI) today announced the addition of the VEEMUX® 4K 18Gbps HDMI Video Matrix Switch to its popular line of video matrix switches. The matrix switch routes Ultra-HD 4Kx2K digital video and audio signals from many HDMI video sources to multiple displays. The SM-16X16-HD4K switches digital 4Kx2K HDMI video and audio signals from sixteen HDMI video sources (computers, Blu-Ray players, satellite receivers, etc) to sixteen displays (monitors, 4K TV's, projectors, etc). Each input can be independently connected to any or all outputs. The 4K 18Gbps HDMI Video Matrix Switch supports Ultra-HD 4Kx2K resolutions of 4096x2160 and 3840x2160 @24/30/60Hz YUV 4:4:4, HDTV resolutions to 1080p, and computer resolutions to 1920x1200. Users configure and control the switch via the front panel buttons, Ethernet, IR remote control, or RS232. It is CE, RoHS, and TAA compliant. HDMI features supported include: HDMI 2.0; Dolby TrueHD, DTS-HD Master Audio, Dolby Digital, DTS 7.1 and LPCM audio passthrough; YUV 4:4:4, 4:2:2, and 4:2:0; 12-bit Deep Color; HDR; 3D; and Bandwidth up to 600 Mhz (18 Gbps). The unit is HDCP 2.2 and 1.4 compliant, and has a selectable built-in EDID table with EDID learning for the support of any HDMI display device. The 4K 18Gbps HDMI Video Matrix Switch has a compact 1RU design and includes a cable management tray. The VEEMUX switch is the ideal solution for any application where information from many video sources is being presented, such as: digital signage, classrooms, boardrooms, trade shows, conference and entertainment facilities, courtrooms, command centers, control rooms, and more. 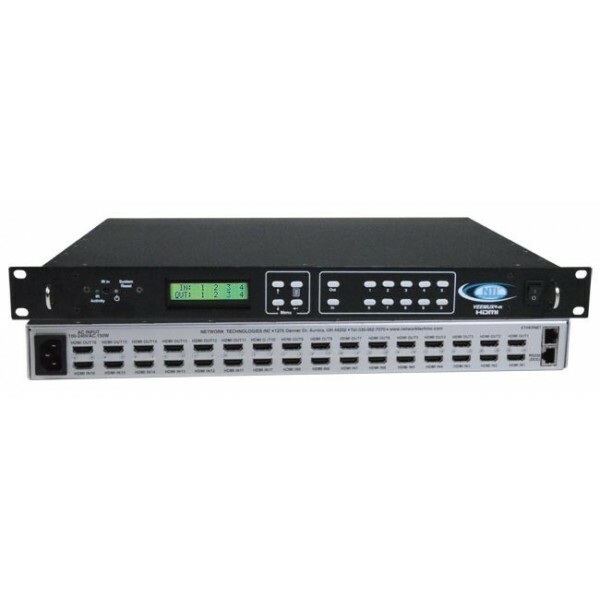 Available for immediate sale, the SM-16X16-HD4K 4K 18Gbps HDMI Video Matrix Switch costs $6,535.